« Love Food – Don’t Waste! My little boy (3 yrs old) was acting like a dishrag. He was tired, clingy, tended to fall asleep even in a 5-minute drive. We went to the doctor and went to have blood tests. He is apparently so anemic I’m surprised he isn’t transparent. Where the ‘normal’ range is 50 to 124 microgram/deciliter, he had 18 microgram/deciliter. No wonder he didn’t have strength to move! So. We give him iron supplements, and we started giving him at least one home-made hamburger a day. The problem is that he is a very picky eater. For starters, he rarely eats lunch in his day care. For another, he doesn’t like soups, or Halva spread (which my eldest loves, and is rich in iron – 3 tbsp Tahini & 3 tsp honey), or most legumes (with a lot of bribery and arguments I got him to eat lentils and white kidney beans, but it happens rarely). 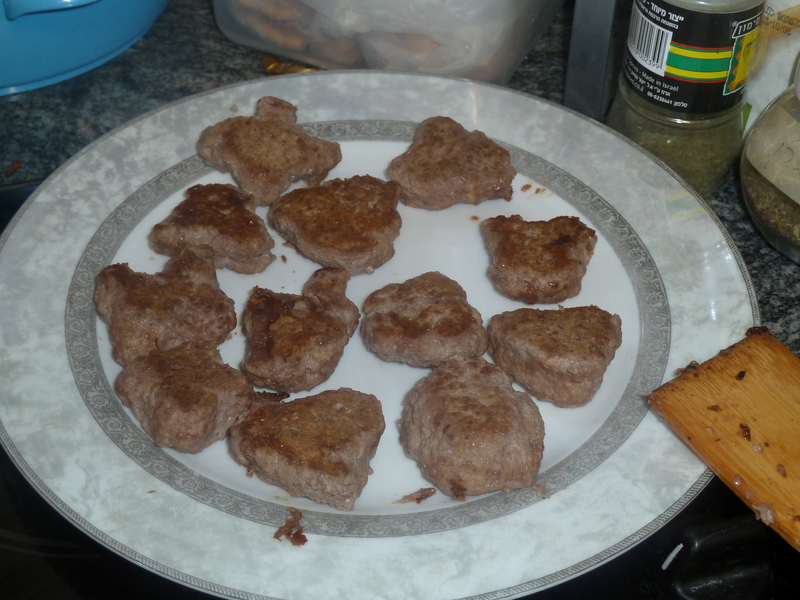 So if he’s willing to eat my hamburgers I’ll bloody well make hamburgers. Heart shaped or mickey mouse shaped. Anything. Just eat. 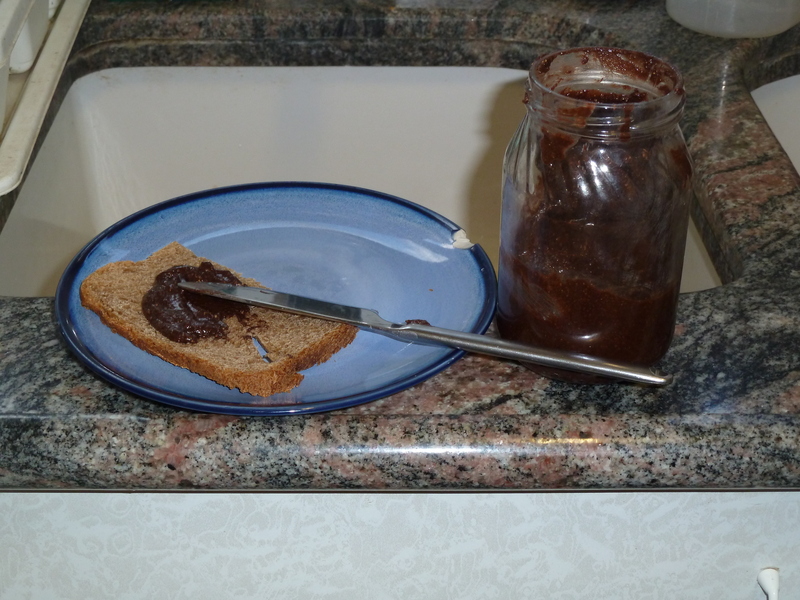 As he refuses to eat Halva spread and even stopped eating peanut butter for some reason, I made my own chocolate spread. My original take was basically halva spread with some added cacao powder, melted chocolate chips and some sugar, but the result still tasted like halva spread and he wouldn’t touch it. So I made Nutella. I bought raw hazelnuts, roasted them myself, blended them into nut butter, added cocoa, sugar and vanilla, and two heaped tbsp of tahini. According to sparks recipe calculator I succeeded in increasing the iron there by 50%. And it tastes like rich Nutella – totally awesome. And as everyone knows, iron is healthy for adults too 🙂 Yum! Mix everything together. wet your hands with water and then form into patties. You can also test your artistic ability by attempting to create a heart shape, or make the circles more pronounced for mickey-mouse shapes. Or butterflies. Whatever works. Fry on both sides (I don’t add oil, it fries in its own fat) until middle is no longer pink. Serve. Roast the raw hazelnuts in the oven at 180°C for about 15 minutes, stirring halfway through. When cooled, rub them in a kitchen towel to remove most of the skins (but not all, or you will be there all day). Blend in a processor until you get a buttery consistency (warning – this takes time! ), stopping every now and then to scrape the sides. Add the cocoa, sugar, tahini and vanilla. Blend. Add oil until it is spreadable. Put in jar and eat! I forgot to say above that I am using Tahini made from whole sesame, so it has a higher nutritional benefit and also a richer flavour. This should work with regular Tahini as well, though.